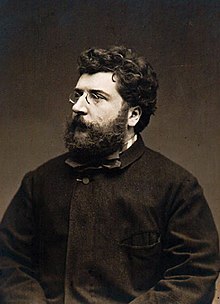 Cumadóir ceoil a rugadh i bPáras ab ea Georges Bizet (Alexandre César Léopold Bizet, 25 Deireadh Fómhair 1838 – 3 Meitheamh 1875). Is é an ceoldráma Carmen (1875) a shárshaothar. Bhí a cheol teagmhasach don dráma L'Arlésienne (An Bhean as Arlés, 1872 le Alphonse Daudet) an-choitianta. ceoldráma "La jolie fille de Perth", foilsithe ar an 28 M.F. 1867 san iris aoire "Diogène"
Ba mhéala mór a bhás. Bhí sé trom ar an tobac. Tháinig taom croí air agus é ach 36 bliain d'aois. Tugadh an leathanach seo cothrom le dáta an 3 Meitheamh 2018 ag 16:10.